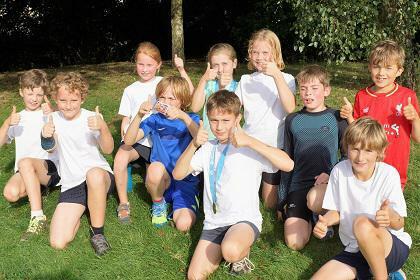 On 5th July the Fitzmaurice Quadkids team went to the Wiltshire School Games in Marlborough. 20 teams took part and there were 200 individuals. The team was Joe, Toby, Danny-Joe, Freddie, Louis, Maya, Jess, Emily, Freja and Tilly. We all tried our best and everyone achieved a personal best. We finished second overall. There were also some really good individual performances as Maya came 3rd out of the girls, Toby came 3rd out of the boys and Joe 2nd. It was a fantastic performance from Fitzmaurice. Miss Blake was really proud of us. Fitzmaurice went to the Kwik Cricket County Finals. It was held at Trowbridge Cricket Club on 3rd July 2017. In the group stage, Fitzmaurice beat Drove Primary School. They scored 248 runs whilst we got 335. Our next game was against St Barts and they scored 179 runs but we hit 276. In our last game we played Five Lanes. Fitz won scoring 289 runs to their 193. We got to the semi-finals which was against Mere School where they got 212 but we got 303. WE WERE IN THE FINAL! – We had to play Greentrees. We won the toss and chose to field first. Once the final was over, there was a nervous wait while they counted the runs scored….they got 254 runs but we got… 312 – WE HAD WON! Mr Tozer was really proud of the whole team’s efforts. On Tuesday27th June 2017, Fitzmaurice School competed in an athletics competition at St. Laurence School where we faced 3 other teams. There was Winsley School, Christchurch 1 and 2 and Fitz. When we got started the Year 5/6 did vortex throwing and the Year 3/4 did long jump. Toby L’s throw was massive and Jess P jumped 1.80cm. After we did those events we swapped around so the Y3/4s did vortex throwing and the year 5/6 did long jump. After that we did a 75 metre sprint, then we did a 300 metre race. were Christchurch 1 with 264 points. So the winners were Fitz with 266 points! On Tuesday 20th June, we went to Trowbridge Swimming Pool at Clarendon School. There were five teams from the district and each team had a year 3 /4 and a 5/6 team. It was highly competitive. Louis W – backstroke 20.18 seconds and butterfly 18.97 seconds. Overall year 3/4 came 1st and 5/6 came fourth. Everyone competed brilliantly and we are very proud of our achievements. On Tuesday 13th June 2017, the Fitzmaurice cricket team played their first tournament of the year. They had a strong squad of players (even without Freddie R who was playing for the county side). In our first match we played Christchurch and our captain, Noah V chose to field first. Starting at 200 runs, Christchurch ended up on 203 (because you lose 5 runs for each wicket) and Fitz scored 244 runs. Our second match was against The Manor and again we chose to bowl first. The captain this time was Oliver C. The Manor got 168 and when Fitz came to bat we got an amazing 347 runs! In our third match we played Churchfields. We bowled first again and they ended up on 206 but we won by 94 runs (which meant we got 300). 61 runs, with Dylan A as captain. Our last match was against Winsley. This was a crucial final to decide who went through as champions. Fitz managed to smash 70 more runs than their opponents which made us unbeaten WINNERS!!!!! so much fun and the end results were amazing. Fitzmaurice Primary School broke the county record by scoring 1708 points! We came 1st. of the best competed at Devizes rugby club. We played first against Nursteed and then played another three matches.Overall in the first round we won two and lost two games. In the 3rd place playoffs were all of the people that came 3rd in their pool. They then played against each other. All of these teams are county level, which is very good. In this play off we came joint 2nd overall. On Monday 3rd April, Fitzmaurice Rugby Team went to Trowbridge rugby club for a tag rugby tournament. After a long wait, we played our first game against Crockerton. They were extremely good; however we still won 6-5. Our next game was against St George’s. We played very well and we won 7-3. Later on we came across Wylye Valley and won 7-3 again. Our final game in our pool stage was against Paxcroft. They challenged us a lot but we still won 6-4. Deservedly, we were through to the knockout stages. We were against Winsley. We won 6-3 and we were through to the semi-finals. Again we were against Christchurch. It was a very close game but we still won 5-4. We were through to the finals! In the final we were against Paxcroft. They put on a good fight but we managed to win 7-5. We were the champions! We are now through to the county finals on Thursday 18th May and we can’t wait! Everyone who took part should be congratulated as they all did their best and worked well as a team. Thank you to all the parent helpers who came along to support us. 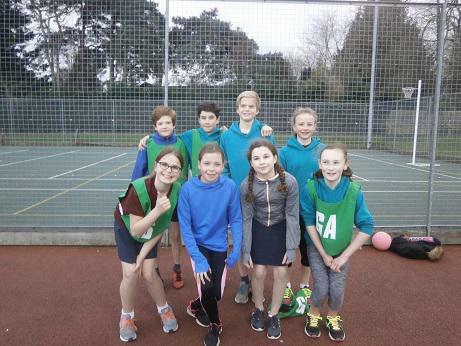 On the 13th March 2017, the Fitzmaurice netball team, (Maya, Tilly, Emily, Jess-L, Freja, Toby, Danny-Joe, Freddie and Miss Blake as the Coach), went to Kingdown to play in the West Wilts Netball finals. We won every match we played in our pool and got through to the semi-finals. We were all very nervous to play the last 2 teams but luckily we got a golden ticket for an access to the county finals – on Wednesday 5th April. Everyone enjoyed the amazing experience of coming 2nd overall. Well done! Jessica P recently competed at the Miss Quatro Angel of the North gymnastics competition in Liverpool and came 3rd in her regional age group. There were lots of girls competing on the day and so congratulations to Jessica for an amazing result! On Wednesday 1st March, Fitzmaurice hosted the cluster netball tournament, – Churchfields, Winsley and Christchurch schools also participated. Fitzmaurice C came 2nd and Fitz B won their pool. Fitz A won all their matches convincingly and are now going through to the West Wilts finals on Monday 13th March at Kingdown School to represent Bradford on Avon. All the teams played extremely well and the school us very proud of everyone who took part. By Toby L and Danny Joe M.
On Tuesday 21st February Puffin class took part in the Wiltshire Schools Dance Festival at the Forum in Bath. 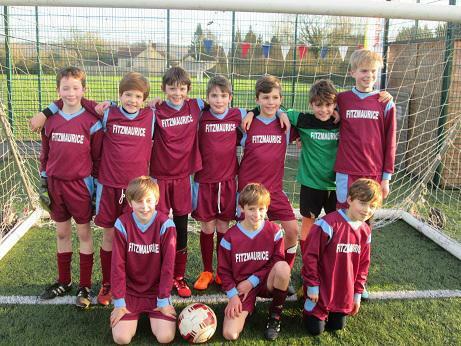 On 18th January, the Fitz football team went to Chippenham to play in the Wiltshire Finals. Our first match was cancelled because the team didn’t turn up, then we played Monkton Park. They were a good side. We scored first but they equalised with a lucky late goal. In the end the score was 1-1. Our second game was against Broadchalke. We played well as a team and won 1-0. Our last game in the pool stage was against St. Peters. They were a strong team so we unfortunately drew 2-2. That team went on to win the tournament. We found out that we had got through to the semi-finals. We were against Clarendon Juniors. They were a really good team and we played extremely well but we lost 2-1. We all played amazingly well and we are the 3rd best team in Wiltshire! Our team was Freddie R, Joe A, Milo M, Finlay H, Dougie B, Toby L, Harry L, Toby P, Dylan A, Noah V.
Congratulations to Joe A, who competed in the Tri Cross Country Championships last weekend. Competitors are from Wiltshire, Avon and Somerset and we are very pleased to report that Joe won! Well done Joe from all of us at Fitz! On Saturday 10th December, West Wilts Force 5’s swimmers including Thomas F, and Louis W swam at Bristol pool and our team came 3rd out of 8 Counties. But that was only just the beginning. On Sunday 11th December, it was the Bradford on Avon Club Championship finals. Thomas F got 3 gold medals and 1 silver medal. Louis W got 4 gold medals and his time for freestyle was 18.06 seconds and a personal best. Evelyn A got bronze; it was her first medal for swimming. It was amazing and 6 people took part from our school altogether (Faith, Harry L, Sam C, Evelyn A, Louis W and Thomas F). By Thomas F and Louis W.
Well done to all our super swimmers from Fitz! Brilliant achievements by all. On Monday 14th November 2016, the Fitzmaurice football team went to Kingdown School to a 7-a-side tournament. We started off with a good 3-0 win over Christchurch B; then we beat Grove 2-0, St. George’s 3-0, Westbury Leigh 4-0, and finally in the group stage Forest and Sandridge 4-0. As we had won all our games we went into the semifinals against The Mead and won 3-0! Then we went to the final against Christchurch A and won 1-0. They were a very good team as they were all year sixes. We won the tournament and were the best team in West Wiltshire! Mr Tozer was very proud of our efforts. In the tournament we scored 20 goals and conceded none! The team are: Freddie (Captain), Joe, Harry, Dylan, Toby L, Toby P, Finley, Dougie, Noah and Milo. We are going to Stanley Park in Chippenham in January to play in the county finals. On 14th October 2016, 9 Fitzmaurice pupils went to the Bradford on Avon schools cluster football tournament, where we played 5 games against schools in our area. 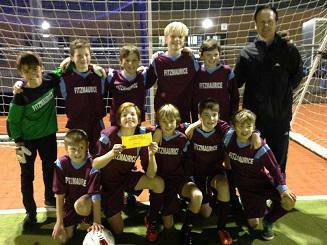 In our team we had Dougie B, Milo M, Toby L, Finlay H, Toby P, Harry L, Joe A, Noah V and Freddie R (Captain). We won our first game against Winsley 1-0. The next game was against Christchurch B, which we won 1-0 again. Our 3rd game, against Christchurch A, we lost 3-0 (unfortunately). Our second to last game was against Westwood and luckily we won 2-0. Our last game was against Churchfields; they were a good team and scored first, but we pulled it back for a 4-1 victory ! Overall we came 2nd. It was an amazing afternoon. Year 5/6 Girls came 2nd and year 5/6 boys were the West Wilts Champions. Fabulous teamwork ! Well done. 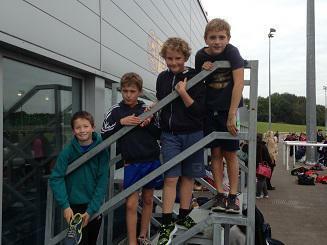 On Friday 7th October four boys from Fitzmaurice took part in a Biathlon in Bath and did brilliantly. Thomas F, Louis W, and George D had never competed in one before, but that didn’t show in the results. A fantastic effort from Fitz again ! Thomas came 11th (in the higher age group because of his birthday), Louis came 9th (2nd in the swim), George came 16th and Joe A came 1st. A massive well done to them all! 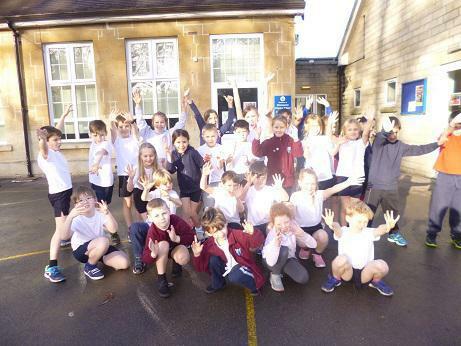 On Wednesday 5th October, Fitzmaurice’s Cross Country team went to Stonar School. We tool a quick look around the course and soon after the year 3/4 girls ran. After the girls ran year 3/4 boys ran. They did very well. Later on the year 5/6 girls ran then the boys did their race. We had a very successful day – Y5/6 Girls were 2nd and Y5/6 Boys were the West Wilts Champions! By Freddie and Toby L.
Fabulous teamwork. Well done to all!!! And a big THANK YOU to our parent helpers too. All teams came 2nd overall in the team events so huge congratulations to all! Sofia F, Mollie M, Lily S, Toby P and Noah V!